Please let us know if you have dietary restrictions. We cannot plan for them if you don't tell us! Note that members benefit from large discounts on event fees! Do you want to become a member today? Do you need to renew your membership? Notes: If you select to become a member or renew your membership, you may use your member benefits and register as a member. If you have any questions regarding the status of your membership, please contact info@laurentiansetac.ca. Student Awards and Travel Assistance are available to Student and Recent Graduate Members only. We recommend that you register accordingly if you wish to be considered for our various Awards. Reduced AGM fees apply for full-time Students and recent graduates who have completed a degree in the last year. If you choose to become a member today, please select either "Regular Member" or "Student and Recent Graduate Member" to benefit from discounted prices. Please choose pricing based on your registration date. New program this year - Mentors are identified by their name tags and are indicating that they are making themselves available for networking. We have booked a pre-AGM boat tour of the Ottawa River, through Paul's Boat Lines. Meeting time is 5:15 pm on Thursday, June 6 2019, at 1 Canal Lane (foot of the Ottawa Locks between Parliament Hill and the Chateau Laurier). The cost for the boat tour is $20 per person. We will have a pre-AGM meet and greet at 7:00 pm near the University of Ottawa Campus at the Highlander Pub (115 Rideau Street, Ottawa). This event is not catered, but we would like to make a reservation for our group. We will provide a fully catered buffet dinner after the AGM at Cafe Nostalgica, on the University of Ottawa campus. To ensure we order enough food for everyone, we would like to know if you will be joining us. The Laurentian Chapter is committed to demonstrating leadership in the battle against climate change, and minimizing the ecological footprint of our Chapter’s activities. In order to mitigate the environmental impacts of holding a conference this year, we are implementing a range of "green meeting" strategies that are designed to help reduce our waste, water, and energy consumption, greenhouse gas (GHGs) and other air emissions. Laurentian SETAC's efforts to minimize our meeting's carbon footprint include, for example, reducing paper use, printing on recycled paper, use of local suppliers (when possible), and encouraging carpooling. Venue and hotel choices are also guided by our "green meeting" strategies. 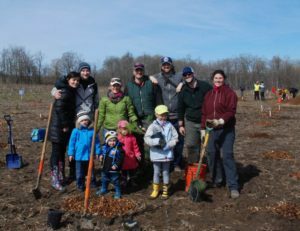 In addition to these efforts, Laurentian SETAC will organize the planting of one tree per AGM participant, in an effort to reduce its carbon footprint. To help us with our initiatives, we ask that you provide us with some information about your travel. Are you interested in carpooling? We will put you in contact with attendees from the same city/region. What city/region are you traveling from? Are you a driver or passenger? How many passengers (excluding yourself) could you take? Thank You for helping us reduce Laurentian SETAC's ecological footprint! Are you submitting an Abstract? Which student category best describes your situation? Would you like to be considered for a Best Presentation Award and the Maria Colavecchia-Pfuetzner SETAC NA Travel Award? The winners of a best overall presentation are eligible for a Laurentian SETAC Travel Award (+ SETAC NA $200 USD top-up) to be used ONLY towards the SETAC NA Meeting. Also, the award cannot be matched with other SETAC NA travel awards for that same year. What is your presentation type preference? Accepted file types: jpg, jpeg, gif, png, bmp, tif, psd, pdf, doc, docx, xls, xlsx, txt, mp3, mp4, aac, wav, au, wmv, avi, mpg, mpeg, zip, gz, rar, z, tgz, tar, sitx. Are you applying for a Student Travel Assistance Award? Please upload your Supporting Information (see Travel Award Instructions). Will you need a receipt? Please submit your registration form. You will then be redirected to the Paypal page for payment. Please note that you do not need to have a paypal account in order to pay for your registration.